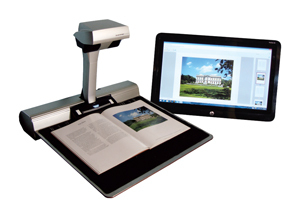 ST Imaging has developed an all new, affordable, overhead book scanner designed with kiosk software for both first-time and professional users. The simple, safe and secure scanning environment will have users saving their scans within seconds. Simply place your document, select where the scan will will be saved (USB, email, Google Drive, Dropbox or printer) and what you are scanning and within three seconds the media is scanned in full color at 600 dpi. See the ST600 scan, crop and flatten images. ST600 Overhead Book Scanner from ST Imaging from Matt Anderson on Vimeo. Request a quote from the ST Imaging authorized reseller in your area. Simply fill out the short form and someone will be in touch with you soon. ©2018 ST Imaging. All rights reserved.